I know that I have been MIA for quite awhile now, but with a less time between Thanksgiving and Christmas, and the medical issues issues I'm dealing with, left me stressed to say the least. Hopefully, I will be able to blog more often now. Just because I haven't been blogging, doesn't mean that I haven't been peeking around on Facebook, and your blogs. Congratulations to Kayle, The Cooking Actress, who was recently engaged. Also, Monet's, Anecdotes and Applecores, sweet baby Lucy is 6 months old already. Time flies, and Gina from SP CookieQueen, is cooking yet another Pig for December 6th. In case you don't know the Midwest has been having Winter snow storms and frigid wind chills. Tonight the low will be -17, not including wind chills. tomorrow the high is only supposed to be -8, very dangerous weather. This morning Scott wanted pancakes, so we decided to try cornmeal pancakes for a change to warm us up. Now, if Fluffy Cornmeal Pancakes sounds like an oxymoron, they aren't. After looking at several recipes on the web, I saw a video on this one from Cook's Test Kitchen, which looked wonderful. This recipe has several important steps, and prep time is about 25 minutes, so don't try to make these, when you are starving. These steps insure that the cornmeal is softened, so there is no gritty texture, and that there is sufficient baking powder, baking soda, and buttermilk to make the cakes fluffy. Don't skip these important steps and you won't be disappointed.These pancakes are full of corn flavor, and no gritty or sandy taste. This recipe yields 15 4" pancakes, so even after feeding Bailey her pancake, we had plenty to freeze for another breakfast. She was dancing in the kitchen, waiting for her pancake. Sorry, no pics of this, maybe next time. First, You take 1 1/4 cups cornmeal, 1 1/4 cups Buttermilk (or sour milk), and 2 Tbsp. butter and whisk in microwaveable bowl. Microwave on high for 60-90 sec, stirring after 30 sec, until slightly thickened around edges. Cover with plastic wrap and set aside for 5 minutes. Then, you combine the dry Ingredients, 3/4 cup flour, 1 3/4 tsp Baking Powder, and 1/2 tsp baking soda, and 1/2 tsp. salt. Whisk in bowl and set aside. Beat two eggs lightly, into an additional 1/2 cup of Buttermilk, mix till smooth, to thin eggs. Add a small amount of the hot cornmeal buttermilk mixture to the egg buttermilk mix to temper the eggs, so you don't end up with scrambled eggs. Add egg cornmeal mix to the rest of the cornmeal buttermilk mix, and whisk, until smooth. Pour Cornmeal mixture over the dry ingredients, and stir until combined. Your batter will be thick. Let the cornmeal batter "rest" for 10 min., before making on a hot griddle. This "rest" allows time for the baking soda to form large bubbles, lightening the batter and then you will have fluffy cornmeal pancakes. Drop 1/4 cup batter onto hot griddle, lightly covered with cooking oil, and excess removed. Cook until edges are set, and bubbles form in the middle, 1-2 min. flip, and cook until second side is golden brow, 1-2 minutes. Remove from griddle to warming plate. Dig in, and Enjoy! Cook's Country recipes rarely go wrong, do they. Your pancakes look perfect! Stay warm up there. I know it's nasy. I love corn meal pancakes but have never tried them at home, this looks fabulous! I had never made them either, but they turned out perfect and tasty. These pancakes looks just perfect! Thank you Hope that you have a great 2014! I'm glad you are back, missed seeing all your delicious food. I'm trying to get back to some sort of regular too and I'm keeping my fingers and toes crossed you and Scott are over the major hurdles of last year. I've never had cornmeal pancakes and will have to give these a try. Thanks for the sweet shout out my friend. Thanks for the good wishes. I am trying to get back to "normal". We'll see how it goes. Try these pancakes, and you'll be pleasantly surprised. Besides they are Bailey approved. It sounds like you're feeling better, Becky and it's great to see you back! 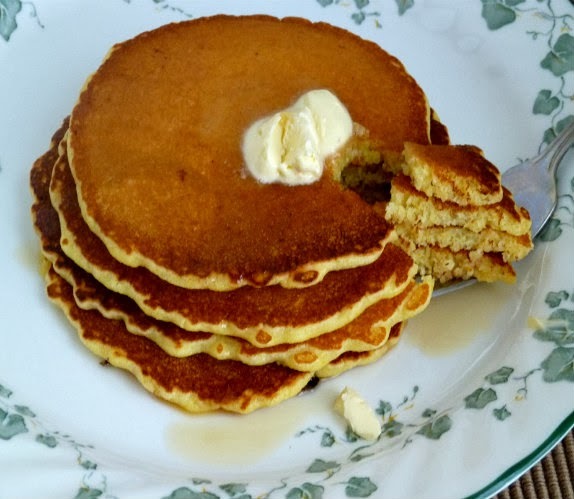 I love cornmeal so have to try these pancakes, they sound great! This weather is definitely nothing to fool around with and I'm ready for summer! Stay warm and take care! Thanks, it's great to be back. These pancakes are kight, fluffy, and full of corn flavor. Stay warm! Nice looking pancakes, Becky. And if Bailey approves, I'm in! It sounds as though you're taking all precautions to stay warm. My best to you & yours. Hi Becky, hope you are feeling better now...sure does look like you've bee MIA for a while. Not easy to keep up with blogging with health issues, especially! Seriously loving your cornmeal pancakes, which I sure do want to make. It looks so fluffy, light and super delicious! Hope you had a wonderful Christmas holiday...Happy New Year! Do try to stay from being outside in this freezing temperatures you are having there and all over most part of the northern states. My family lives in Ohio near lake Erie...just across from Canada, and it is 'brutal' there right now, as well!